Recently, my husband and I have been challenged and questioned about our new practice of contemplative prayer and meditation. The “fear” is that we are losing our so called Christian foundations. All of a sudden we are of “concern”. This type of concern is not new to us. It has happened to us many times in 30 years. If we don’t act the same way, we are somehow “backsliding” instead of being perceived as ones who long for a deeper spiritual life and understanding and relationship with God. So today’s post is some of the research we did when we embarked on this whole contemplative prayer journey. My husband, Mike is getting his doctorate in this subject, because of how it has transformed our spiritual lives in such a deep and profound way. When you learn the richness and fullness of the “inner life” and all that God has for you in it. The outer life is no longer threatening or stressful. It actually becomes refreshing and alive, and one’s true nature and identity in whom God created you to be is exciting. 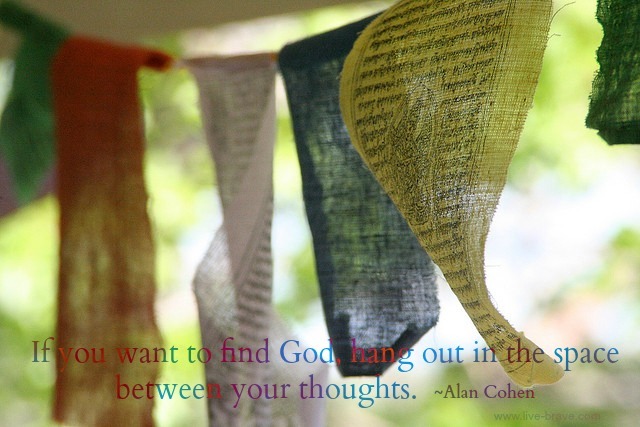 If you sincerely want to know God, hang out in space between your thoughts. I took a class my second semester in bible college called “study on prayer”. It was a miracle that I went to Bible college in the first place, and I am glad I did, irregardless of all the religious baggage I accumulated, it was part of my journey. I didn’t take the study on prayer class because I was dying to learn how to pray, but because the class was a prerequisite for dating in the Protective Isolation of the pentecostal church/bible college biosphere (cut off from the outside world) I was part of. At 19 years of age, my previous experience in prayer was the familiar morning after negotiation, “Please God get me out of this and I will never do that again” in reference to drugs, drinking, girls, or money situations. I was now going to learn how to pray for someone other than myself, and in front of people, this was going to be rough. Should I make a list? How long should I pray? How will I know when I am done? What is the highest priority of what to pray for- salvation, healing, protection, provision? I visited a couple prayer meetings to get a feel for what I was now going to participate in. It was confusing and intimidating to say the least. The class examined the questions: Why pray if God loves us and already knows our needs? Why pray aloud? Why be much in prayer? Why pray in other tongues? Why pray in English? What type of prayers are and are not answered, and why? And what do these terms mean: prevailing prayer, travailing prayer, intercessory prayer? Even as a green horn, I realized the class was coming at prayer from the vantage point of what I was supposed to say and do and I discovered almost by accident the other side of prayer (what God says and does) while I laid down on a pew in the chapel “soaking” to peaceful music- saying nothing at all. If prayer was a conversation, then how and when does God speak? According to Jesus in the famous Matthew 6 (vv.1-14) section where he teaches his disciples about prayer, God speaks first as taught in vv. 1-8. The class did not really cover contemplative prayer or meditative prayer or listening to God and the majority of churches I have been a part of don’t get it either, but it is absolutely a critical foundation. Charismania is so consumed with our authority and response in prayer calling heaven down to earth from the second half of Jesus’ teaching (vv. 9-14) , that we have missed the foundation and base, our center from where that authority comes from- just being with God. All of a sudden those passages we read about where people including Jesus, prayed all night, now made sense to me, they weren’t praying with words, they were doing the other kind of prayer, they were meditating, practicing the presence of God, practicing silence. Every major faith and religion has an understanding of connecting with God ( via restful awareness/meditation) before petitioning God. Meditation is an Eastern religious practice you say?- Jesus was a Middle Eastern man and he meditated- deal with it. Verses 5-8 of Matthew 6 are detailed steps for meditation or contemplative prayer that we will look at. This is not a new practice, in the church, but it is experiencing a resurgence across all denominations. Luke 5:16- Jesus often withdrew to lonely ( private) places and prayed. Before I look at Matthew 6, let me describe some of the characteristics of Contemplative prayer/meditation/centering prayer/restful awareness. *The whole point of centering prayer is you come back to who you really are (identity) in the presence of God, you are centered, you cannot get thrown off balance when you know your identity. In silence you possess your soul- meditation is concerned with being not thinking. 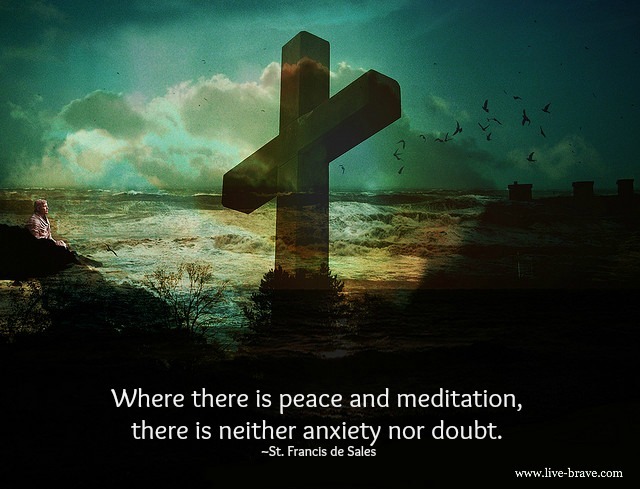 The core of meditating is Christ in us, praying in us, with us, for us- Jesus said “ I know where I came from and where I am going”- he knew his source from his contemplative prayer as the Father. The essence of meditation is accepting the gift of being while remaining non possessive. Contemplative prayer is not speaking to God or thinking about God, it is not bringing him your problems, it is just being with him. Contemplative prayer is not being intentional, but paying attention. Matt. 6: 5-8/25-27 “And when you pray, do not be like the hypocrites, for they love to pray standing in the synagogues and on the street corners to be seen by others. Truly I tell you, they have received their reward in full. 6 But when you pray, go into your room, close the door and pray to your Father, who is unseen. Then your Father, who sees what is done in secret, will reward you. 7 And when you pray, do not keep on babbling like pagans, for they think they will be heard because of their many words. 8 Do not be like them, for your Father knows what you need before you ask him”…..
-v. 6. The room in v. 6 is sometimes listed as a secret/mysterious room or private room, not talking about a physical place, but the heart of the believer. A mystery is a reality that is not discernible to the mind, but is a reality nonetheless. The intent is to go inward where the kingdom of God is, and close off all other distraction. -v. 7-8. Here is a truth listed many people need to see, saying things (the same things over and over again) has little or no value. A son speaks to his Father ( relationship)one time, many times one word is used in a meditative prayer to help center from distraction. The pagan with no relationship feels the need to throw out many words and the same words with no confidence that the deity hears. -v.7-8 – Here we see prayer re-defined. It is not primarily asking because he already knows what you need. After you spend time in contemplative prayer, you will many times lose the anxious need to ask for whatever it was, and now have the ability to trust the timing. What is prayer then- not just asking, but being. Previous postWriter, we want to encourage you. People and their “concerns”, sigh. Fear and religion cannot define nor regulate our prayer lives, whatever form it takes. No one may categorize or take away our experiences with God. I am honored to be your friend and I believe in you! I think the saddest part for me, (having been down this road before) is that those who are concerned, never really loved me for who I was/am…but instead for what I stood for. The fear is their reflection, not mine. I wish I didn’t understand this on the deepest levels. I could probably write an entire book or series of books on this topic. The intensity of prejudice and persecution from people I thought knew me and my husband best is over the top and more painful than I can possibly express here. The betrayal, the gossip, the straight up slandering of our reputations, unreal. The worst, when your kid comes home upset because they were sitting in a restaurant behind someone who is slandering you and didn’t know your child was there. My child felt the need to leave undetected because they felt so horrible for me. That’s a tame example . . . I have way too many of these things I haven’t shared. I hope one day, I will find a solution that doesn’t feel like perpetuating the pain by responding in that same spirit. The good news is, it forces me to continue on my journey regardless of the opinions of men. I find peace on my journey and meditation is a huge part of that peace and living a Presence filled life. That is why this piece of yours is so important. Thank you. Then, maybe I’m naive, but it baffles me that people “fear” you are losing your Christian foundation. Isn’t a deep relationship with God at the root of it? And most importantly, you both continually challenge, and help me, to grow. I learn so much from you. Meditation/contemplative prayer is what I need and desire right now, so thank you from the bottom of my heart for this awesome knowledge. I will refer to it often. Love you guys. When we learn to quiet our inner self is where we find the courage to stand by our core, and do the things we have always dreamed of. When I always used to say I liked to pray because I liked to “hang out” with Jesus, I got a lot of funny looks. For me prayer has always been more about being with Him than getting stuff from Him. We both like it that way 🙂 You just keep being you and stay on the journey that leads YOU to His heart and to rest. It’s good there. Love you <3.